A November heat wave? Even as a native San Franciscan I find this to be unique. But, that's what we're getting now and with predictions for rains towards the end of the week, I'll take all the sunshine I can get while I get it. As a result of the weather patterns, this outfit is purely about comfort. I literally threw on a t-shirt and shorts. I was also experiencing an odd hair moment, so I threw a lid on it 'cuz...well...I could. There's no rhyme or reason to anything in this look, but for me, it works. There was something about this weekend where all I wanted to do was feel relaxed and comfy. How did you dress this weekend? P.S. Don't forget to VOTE tomorrow for those of you in the USA and who are able to vote! I love this jacket! You totally paired things together that I never would have thought of, but it works! That jacket is so cute! We are having a "heat wave" in CO too as it has been 70 for a couple of days. Sad. But I'll take it! I hate the snow! Yesss, loving this! Can't believe the weather over the weekend. Not too hot and not windy!!! lol. This is such a cute outfit! I love the jacket paired with the striped shorts and pink shirt...it's such a unique combination! what a cute edgy look, love it! I love love love that jacket! and the hat is an awesome addiction to the look. You look great! Really cool! love your jacket! It did warm up a little over the weekend here in south bay. It's funny to see you in shorts in November in SF. I don't know how you deal with the crazy weather up there. Cute shorts and jacket! gah! nancy! you look amazing! that jacket is to die for! So cute! Love the jacket. Nancy, this weather is super crazy girl! I love that jacket. Super great blog, that for letting me know! Love the jacket with the pink underneath. 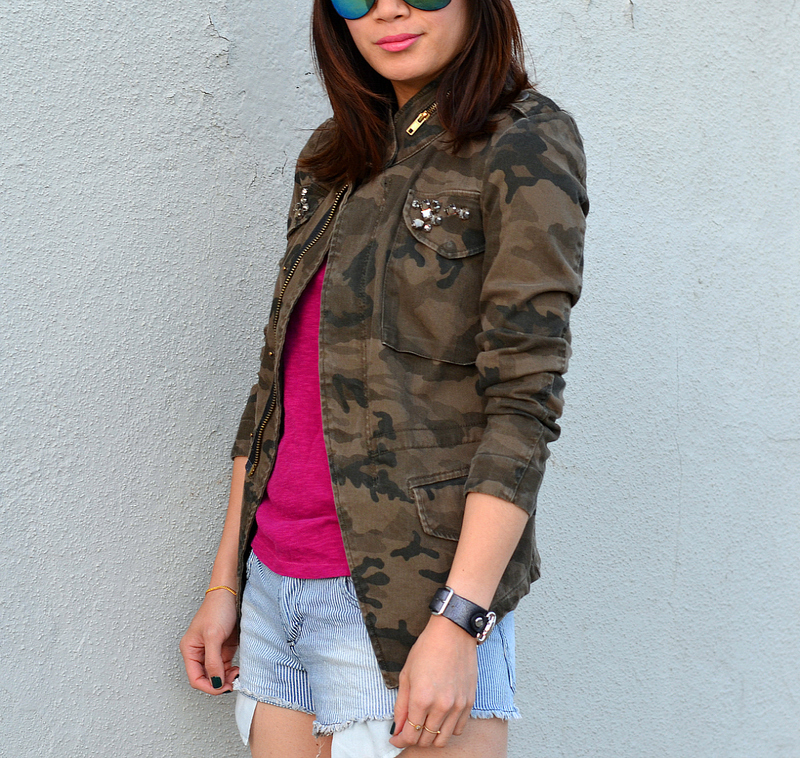 The weather today is SO HOT, I can't believe it's almost Winter... anyways I love this camo jacket on you!! I was wondering why everyone at the 49ers game had short sleeves on when I was watching it yesterday! It all makes sense now. We are experiencing an early winter over here on the east coast with temps in the mid 30s, eek! I'm so jealous! This is such a fun casual look, love the sunglasses. Great Outfit! I love it and the sunglasses are so cool! Fun outfit! I'm loving the touch of rhinestones on that jacket! I really love that camo print jacket, hun. It's actually starting to cool down here in Hawaii. Yippee!!! Lucky that you can still wear shorts:) It's freezing over here in Toronto! Great outfit, the military jacket with pink shirt is awesome!! <3 Wanna follow eachother? Let me know, sweetie! Nice outfit! I'm digging the camo! What a cute casual weekend wear! 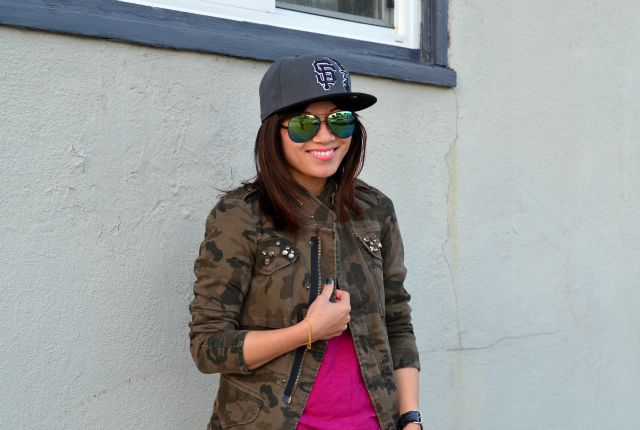 I love that camo jacket, it's certainly adding a lot of character to this outfit! And I can't believe you're experiencing summer temps, it's getting quite chilly here in the East Coast! great outfit! you're working it! love this outfit! your wearing the camo jacket from zara i wish i had brought! Aww... I like your sneakers!! I WISH we were experiencing a heat wave. It was something like 29 degrees this morning when I woke up! I'm really loving your camo jacket! Thanks for your visit and kind comment on my blog dear! I think your blog is amazing so I'm following from now on GFC. Would you like to follow me back? ?